The Lacket is the innovative new ladder safety product that stops an extension ladder from slipping sideways or falling backwards vertically. 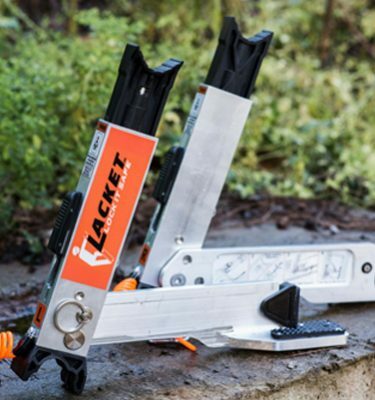 The Lacket’s patented, award-winning design uses a unique wedging effect to lock an extension ladder firmly into position, and through extensive testing has proven to withstand even the most extreme conditions. The Lacket is the only adjustable ladder safety product that enables you to secure an extension ladder before even setting foot on the ladder. Before you step on a ladder, Lock it Safe with Lacket. If you’re a NSW business, you may be eligible for a rebate for the purchase of a Lacket under the SafeWork NSW Rebate program! The Lacket is now available for sale through our website! We are currently in discussions with a number of distributors throughout NSW who will be selling the Lacket and providing training in its use. We will update the website when the Lacket and accessories are available to be purchased through a distributor. Please contact us if you would like to see all ladder users have a safe experience when working at heights, and would like to be an authorised distributor of the Lacket. The Lacket is based on a simple patented design that uses a wedging force to secure a ladder from sliding horizontally or falling backwards vertically. The Lacket firmly secures an extension ladder without the user first needing to step foot on the ladder. The ladder is completely secured before the user ascends. The Lacket complements fibreglass ladders to ensure safe working around electricity. The Lacket has undergone rigorous testing, and has proven to remain secure even when the ladder has been subject to the most extreme sideways and backwards forces. The Lacket is a ladder attachment that is fully adjustable to fit any of the most commonly used ladder makes and models that meet Australian safety standards. It secures a ladder using any overhang, without removing roof tiles or drilling into the building fascia. The Lacket can remain attached to your ladder, whether or not it is being used, so you don’t need to repeatedly install and uninstall. The Lacket folds conveniently away within the ladder rungs when the ladder is being stored or transported. SafeWork NSW (formerly WorkCover NSW) agrees that The Lacket is an acceptable means of securing a ladder. If you’re correctly using The Lacket to secure your ladder on a NSW worksite, you’ve satisfied SafeWork NSW. How does The Lacket work? The Lacket uses a wedging effect to secure an extension ladder to any building or structure that has an overhang. Have you ever tried to jam a door closed by wedging a chair underneath the door handle? That gives you a rough idea of how the wedging effect is used to lock the ladder into position. When combined with the provided safety straps to tie off the base of the ladder, the ladder is wedged or jammed into position and cannot be moved. What materials is The Lacket made of? The Lacket is made from a combination of Stainless Steel, T-6061 alloy and high density impact resistant plastic. Plastics are also UV rated to withstand constant UV rays without compromising the structural integrity of The Lacket. It’s built to last wherever you store and use your ladder. These materials have been specifically chosen for their strength, weight and ability to resist rust and corrosion. Has The Lacket been tested? The Lacket has undergone rigorous testing by independent engineers to prove that it can withstand the most extreme forces – forces that would never normally be exerted on a ladder. We always recommend that the strictest ladder safety be adhered to, even with The Lacket in place to secure your ladder. Is The Lacket approved by Australian safety governing bodies? 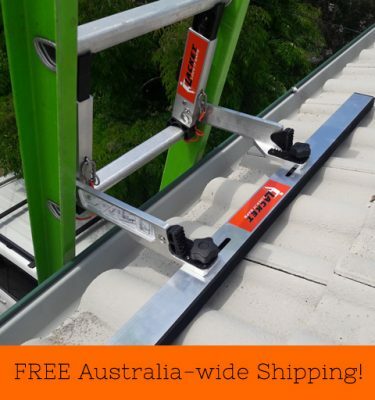 If you use The Lacket in conjunction with the provided cam-buckle tie down straps, you will fulfill the requirements for securing the top and bottom of an extension ladder as required by Australian safety governing bodies. Will The Lacket fit on my ladder? 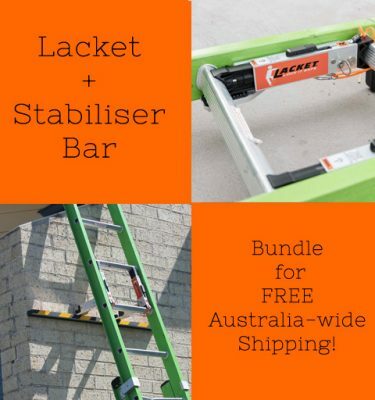 The Lacket is fully adjustable, and will fit on any of the most commonly used ladder makes and models that meet Australian safety standards. Do I have to secure the bottom of my ladder when using The Lacket? SafeWork NSW recommends that you secure the top or the bottom of the ladder (or both). We at The Lacket Company recommend that you never work alone on a ladder. However we understand that this is not always possible, so here are some alternate solutions for securing the base of the ladder whilst using the Lacket to secure the top. And remember, good ladder safety means you should always use a ladder on a level, immovable surface. Place a weighted object (such as a 20kg sandbag, bag of concrete etc) at the base of the ladder. Stabilise the feet of the ladder through the use of a ladder feet stabiliser or ladder leveller etc. Tie off to a ground peg. We have supplied two 4m cam-buckle straps so the operator can secure the base of the ladder. Tie off to weighted object (greater than 20kgs), using the supplied 4m cam-buckle straps. The weighted object could be a bag of cement, a bag of sand etc. Tie off to any fixed structure. Where Can I Buy The Lacket? Watch this short instructional video for all you need to know to use The Lacket on your extension ladder. The Lacket user manual is available for download as a PDF. How do I Install the Lacket Stabiliser Bar? 1. Before erecting your ladder, attach the Lacket to the ladder. 2. Fold out Lacket arms on left-hand and right-hand units. 3. Unscrew knobs from the Stabiliser Bar. 4. Place the Stabiliser Bar underneath the end of each of the Lacket arms, and push the Stabiliser Bar screws through the hole in the Lacket arm of each unit. 5. Attach knobs to the Stabiliser Bar screws, and tighten. 6. Erect your ladder, and place the Stabiliser Bar against a flat wall or over the top of a structure. SafeWork NSW currently offers a $500 rebate on the purchase of eligible safety equipment, and as a winner in the SafeWork NSW 2017 Awards, the Lacket is an eligible product under the rebate. This means that the full cost of two sets of Lackets ($249 plus GST per Lacket) can be redeemed through SafeWork NSW. Please note that GST and postage is not claimable through SafeWork NSW, however GST can be claimed through your regular BAS reporting. There are a few simple steps to be followed in order to receive the rebate, and we’ve outlined them for you below to make the process as easy as possible. 1. Is your business eligible? If you answer Yes to all the following criteria, you are eligible for the small business rebate! Are you a small business (less than 50 employees) or sole trader? Do you conduct a commercial business producing goods or providing services in NSW? Is your business registered in NSW and does it come within the scope of the work health and safety legislation in NSW? 2. Watch a free, online 30min SafeWork NSW video (also called a “webinar”). Webinars are available for viewing on the SafeWork NSW website, by clicking here. When the webinar is complete, print out the certificate that is displayed at the end. 3. Purchase up to two sets of Lackets after you have watched the online webinar (within 6 months of completion). You can purchase the Lacket from our website (click here), which accepts Credit Card payments using our secure payment facility. Alternatively, email us on sales@lacket.com.au and we can send you a Tax Invoice that can be paid by either direct bank transfer or credit card. Once we have received your payment, we will send you a receipt as proof of purchase. 4. Once you have received the Lacket and are using it in your workplace, complete the SafeWork NSW Small Business Rebate online application form. Form can be found by clicking here (links to business.gov.au). 5. Submit your application, either online, by email or post. You will need to attach copies of your tax invoice and receipt to the application. Your rebate for the cost of the Lacket ($249 for one set or $498 for two sets) will be processed by SafeWork NSW, and the funds will be deposited to the bank account you nominated. We’re an Australian owned and run company that wants every ladder user to have a safe experience when working at heights. The Lacket Company was formed in 2015, when two mates (a Paramedic and an Engineer) discovered that there were no simple, practical ways to secure an extension ladder in order to prevent the ladder from slipping or falling. As they witnessed an increase in the number of hospitalisations due to falls from ladders, the developers wanted to look at the problem from another perspective. After researching products currently available in the market, they quickly realised that all the options were impractical, dangerous and didn’t actually secure the ladder to a stable structure. The biggest problem they found was the need to secure the ladder prior to climbing it, as many of the currently available options require the operator to climb an unsecured ladder in order to secure it. After almost three years of research, design, development and testing, what evolved was the most innovative ladder safety attachment that met the shortcomings of anything else on the market. Because this safety attachment caused the ladder to be as stable as though it was bolted to the building with a bracket, it was named The Lacket. We hope that you get to experience the confidence that The Lacket will give you as you climb your extension ladder. The Lacket Company is proudly based in the Illawarra, and intends to remain a local business for many years to come. 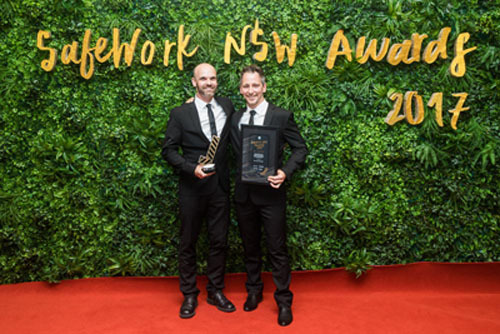 In October 2017, The Lacket Company was proud to receive the SafeWork NSW Award for Best Solution To An Identified Workplace Health And Safety Issue for small business! © 2019 The Lacket - Lock Your Ladder Safe. All Rights Reserved, The Lacket Company. Need to get in touch with The Lacket Company? We’d love to hear from you!